When you’re 16 and handed a driver’s license, everything is fresh and lovely and exciting and free! You have no idea how much you’ll come to hate driving within a few years. No one tells you the real stress of driving doesn’t come from tailgaters, speed-demons or police lights in the rearview mirror. Real driving stress comes in parking lots. 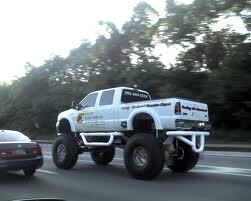 1–Big Trucks: The man driving this truck has body-image issues. The truck is a double-extended cab, making it twice as long, and the tires he stole from a nearby dump truck make it twice as tall. His side-view mirrors consist of full-size body mirrors attached to each side of the cab. To add a touch of class, he has mud flaps with the silver silhouette of an anorexic Barbie doll. There is no way you can see past this truck as you pull out of your parking space. 2–Errant shopping carts: It doesn’t matter where you park, someone will crash their shopping cart into your car door. Or. Every parking stall has a cart left directly in the center, so you can’t pull in. The cart was left there by someone too freakin’ lazy to walk it back to the cart stall. 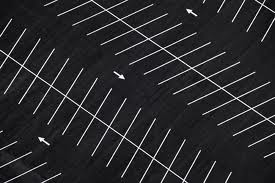 3–Going the wrong direction: There’s a reason arrows are painted in parking lots. These directional clues tell you which way the front of your car should face when looking for a place to park. It seems some people don’t understand arrowial instructions, and just drive willy-nilly up, down, diagonal, sideways–whatever route gets them to Walmart fast. 4–People waiting for you: I found a prime spot to park, and you want it. That’s fine. Just stay back far enough so I can back my damn car out! There’s always that jerk idling right behind you, with his turn signal on, backing up traffic while you unload your groceries, strap your toddler into his seat, find your car keys and load the handgun under your seat. If they tap their horn (letting you know they are waiting), I move more slowly. 5–Pedestrians: Get the hell out of the way! Why do you insist on walking down the middle of the parking lot aisle? You amble toward the store’s entrance, not realizing (or caring) an entire caravan of cars is behind you, deciding if jail time is worth running you down. Sometimes it’s just easier to walk, bike or crawl–and it has nothing to do with saving the environment. It’s saving my sanity. You are super funny! You know what I love? When I see one of those compensator trucks parking and then a tiny girl gets out of it. Doesn’t that just throw your mind for a loop? It’s like, “Whoa, she doesn’t have image issues. She’s a girl who can drive a BUS!” Oh, and I apologize, I’m the idiot going against the arrows every time. But I never wait to get a prime space; do I get “compensating” points for that? Peri, you continue to make me laugh out loud with your brilliant observations and astute grasp of the English language. ” Arrowial Instructions,” Hilarious! Glad you laughed! Thanks for reading!